One of the things I’ve enjoyed about my new Atrix is the ability to play more games at full blast, so to speak. There’s a distinct difference between my overclocked-to-hell-and-back Milestone and this dual-cored beast, and it really shows when you run some apps. 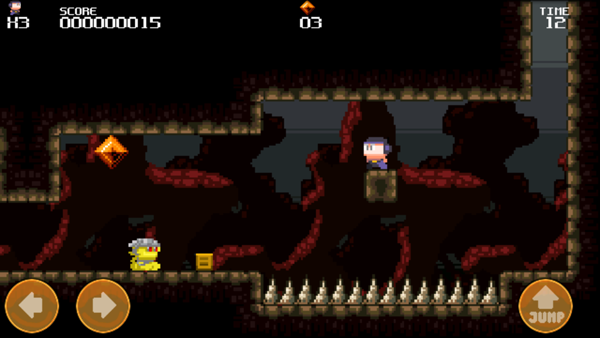 Meganoid, however, is a game that works amazingly well no matter what phone you have. A mix of old-school platforming and new-school mechanics, this OrangePixel offering is quite impressive. 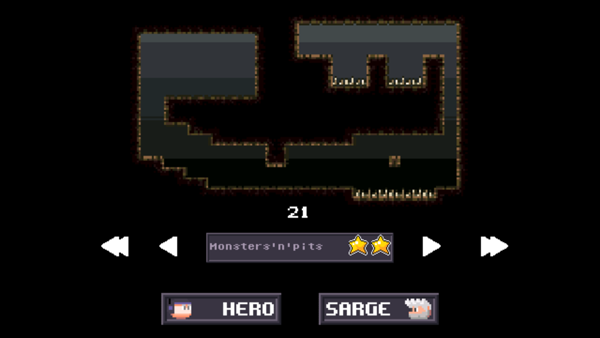 The premise is simple: your character “Hero” must traverse a number of increasingly-difficult levels, collect gems and avoid the numerous one-hit-kill hazards that stand between him and the level’s end. As you play through the levels, medals are given at the end of each based on how many gems you collect and whether you beat the level’s timer or not. It’s very similar to games like Super Meat Boy or VVVVVV; simple mechanics, but a difficulty that ramps up quickly to keep you hooked. The Hero can double jump and pick up crates to throw at aliens; that seems to be the extent of his skill set. Everything else is left up to the player to see whether he survives or not. This, however, is kept relatively non-frustrating by the slick controls at your disposal. The game has a number of control schemes, including on-screen buttons (my preference) and tilt controls. I haven’t been able to get my hands on a WiiMote to test out its remote controller functionality, but I can imagine it adds a new layer to the “old school” gaming feel. I’ll definitely be trying this out as soon as I can. While this might seem weird to say, the game feels very complete. The controls work amazingly well, and are easy to pick up. The challenges are laid out well, and feel rewarding to achieve: beating the timer and getting all the gems for a level unlocks the “Sarge” version of that level, where you play as a different sprite but in a drastically more difficult layout. This is similar to the “Dark World” of Super Meat Boy in the sense that gamers who don’t want to play the levels can skip over them entirely, but the masochists in us can try them out if we want. There is also OpenFeint support for those who like those shiny achievements, but I usually skip over them. I only have a couple complaints about this game, and they’re related to the mechanics. For instance, you only have a three life limit for each play session: if you die three times quickly, it’s back to the main menu for you. For particularly hard levels, this is frustrating; other games that can kill you instantly at least have the courtesy to let you spawn infinitely. Another quirk is that the countdown timer does not reset when you die; if you’re hoping to beat the time on particularly difficult levels, you better hope to get them done on your first try. While this doesn’t seem major, it kind of punishes players who want to meet that goal and die. Otherwise, I can’t really find a reason to not recommend this game. It plays well and all the parts fit together nicely; it even wins some points from me because there doesn’t seem to be an iOS port. I feel that there isn’t enough Android-exclusive games with polish in the Marketplace, and hopefully Meganoid will inspire some developers to step up in terms of quality. 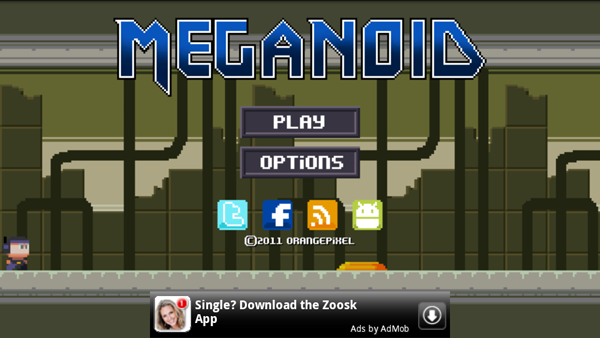 Meganoid is a free download in the Android Marketplace. Matt Demers is Droid Life’s app guy and is surprised how often he picks this up just to play a level or two. If you like his work, you can find him on Twitter and check out his portfolio. Google Commemorates the Ice Cream Sundae with Doodle, Android Related?